I get it, I was just in your shoes a few months ago. I wondered how I would do this. How would I mother a toddler and a new baby? Would I have the patience? Would I remember how to change a newborn’s diaper? How would I survive on such little sleep again, with two children? Would I be able to love this baby as much as I love my toddler? I was full of so many questions and so much fear. I had read the articles and was told that as soon as I held our new baby, my heart would grow with so much love for her. However, I had no idea if that was true or not. I remember in the weeks leading up to our little girl’s arrival, trying to breathe in every moment with our toddler. Lingering at his bedside a bit longer each night and cherishing the last moments that we would be a family of three. Then, I was diagnosed with preeclampsia and told that my scheduled c-section was being moved up 2 weeks. Of course, I was concerned for our little girl’s health being born at 37 weeks, but I was also secretly mourning the loss of those last two weeks as a family of three. The night before I went in for my c-section I tucked our little guy in and told him ‘goodnight’ through streams of tears. I was beside myself wondering how I could ever love another as much as I love this little guy. Then, I heard her first cries. I saw our perfect little girl for the first time and all of those fears subsided. Every article I read about my heart expanding with so much more love was right. 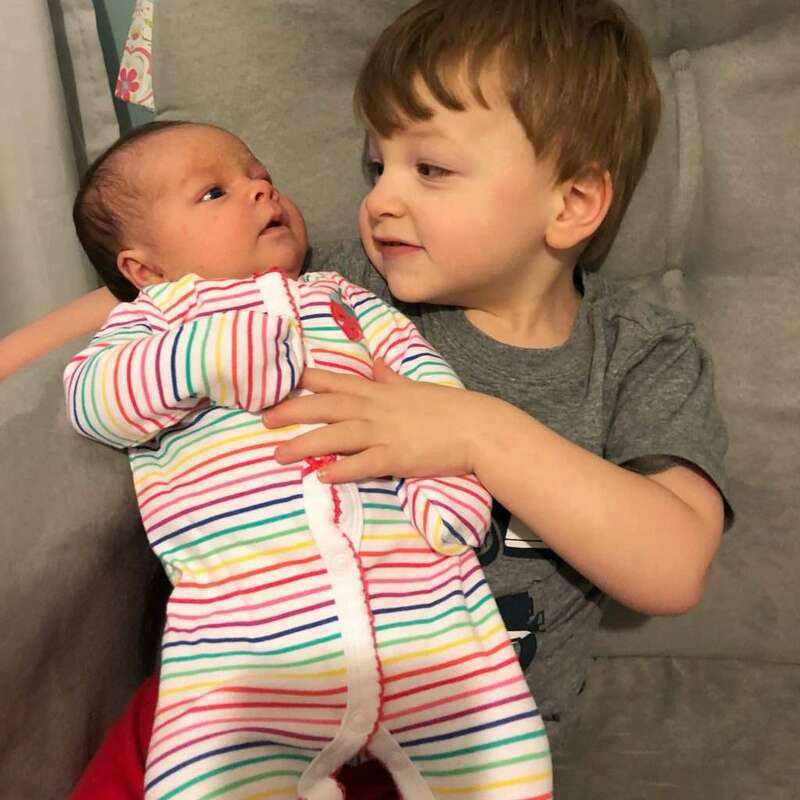 When our little guy met his sister for the first time, she was in an isolette, on a gurney about to be wheeled to an ambulance to be transferred to the NICU. I was beside of myself and you know what that sweet two year old said? “Sissy.” He had never met her. He had never been in a situation like that. But, he knew, that was his sissy in there. 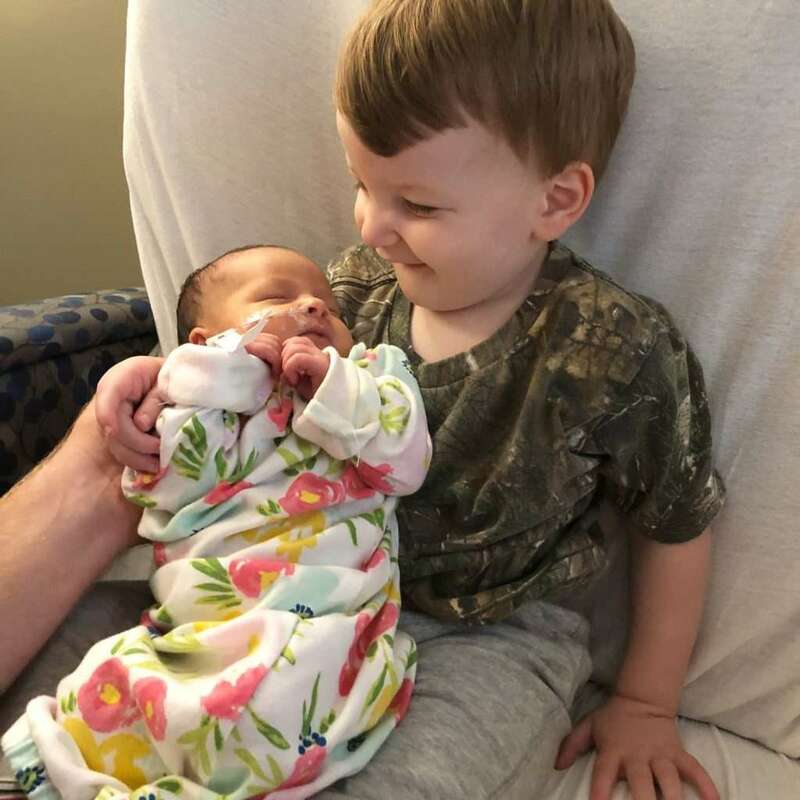 The first time he held her, she had a feeding tube in and we were in a hospital setting that would be scary for any one, especially a two year old. While he was a bit nervous, you can see his reaction below. Each day that has gone by since I’ve been a mom of two, I have been so amazed at the love that our little guy has for his sissy. I’m in awe of how much he worries about her and wants to take care of her. Each day, my heart grows a few more sizes and my love grows even more for these two (how is that even possible?). I’m here to tell you that, there will be hard days. Some days, you’ll wonder “what did I do?”, “can I really do this?”. The answer is, yes, you can do this and this too shall pass. We’ve had difficult days that we’ve all three been in tears at one point. I’ve asked my husband “are you sure I can do this?”. I’m not going to sugar coat it, in the beginning, it’s difficult. Take time for yourself, even if it’s just a hot shower. Remind yourself that you can’t do it all and be it all for everyone all the time, give yourself grace. But, I’m also here to tell you that, this is the best thing that you’ve ever done. You will look back and just like with your first born, you won’t be able to remember life without your second born. You can do this and when the days are difficult, just remember why you’re doing this: for those little ones that you are blessed to care for.